Olive leaf extract and the phenolic component oleuropein can carry various health benefits. The journal "Life Sciences" published a study conducted at the University of Messina, Italy, which reports that oleuropein may be a source of microbial agents protective against intestinal and respiratory tract infections. Another study led by M.T. Khayyal of Cairo University reported that oleuropein has blood pressure-lowering effects in rats, "Life Sciences" notes. Due to its potential benefits, olive leaf extract is currently available in supplement form. It is not currently considered a medical cure for any condition. Use caution if trying olive leaf. NOW Foods offers olive leaf extract in two concentrations, both sold as vegetable-derived capsules. The regular-strength capsules contain 500 mg of olive leaf extract and are standardized to include 6-percent oleuropeins, while the extra-strength capsules feature 18-percent oleuropeins, the company website reports. The extra-strength form also contains 500 mg of echinacea. The products are free of additives, preservatives and pesticides and are suitable for vegetarians and vegans. 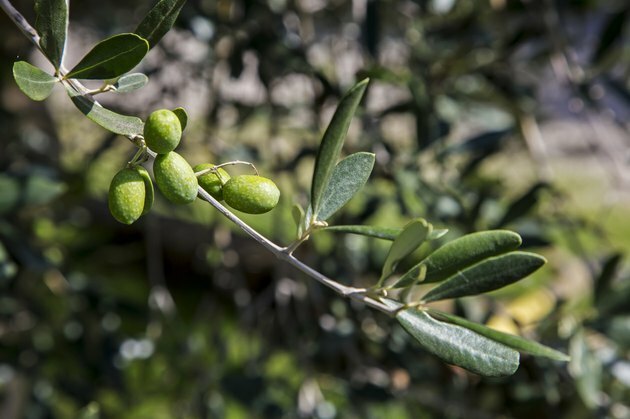 Nature's Way Olive Leaf Standardized, manufactured by Nature's Way, is also a vegetable-derived capsule and is standardized to include 20-percent oleuropeins. According to the company's website, the standardization of oleuropeins ensures that a significant quantity of this constituent is included in the formula. This product is meant to be taken twice daily, according to the Nature's Way website. Only Natural Olive Leaf Extract contains 6-percent standardized oleuropeins, as well as other added nutrients. According to the company's website, these capsules contain 500 mg olive leaf extract, 150 mg echinacea and 50 mg selenium. The product's antibacterial and antimicrobial effects are said to guard against viruses like herpes and influenza, fungal infections and parasites. It is purported to enhance immune system function, although it is not considered a medical cure for any condition. This product is meant to be taken once daily with water. Gaia Herbs Olive Leaf Extract contains a guaranteed 50 mg oleuropeins per 500 mg of olive leaf extract. This extract is in the form of liquid "phyto-caps," according to the company's website, and is suitable for a vegetarian diet. The product is also free of pesticides and heavy metal toxicity, the Gaia website reports. "Life Sciences"; Oleuropein, the bitter principle of olives, enhances nitric oxide production by mouse macrophages; F. Visioli, et al. ; 1998. What Are the Benefits of Consuming a Daily Dosage of Olive Oil?